Yea Ran tends to her crops near her home right in front of former Khmer Rouge navy commander Meas Muth’s house in Battambang province’s Samlot district. Ms Ran, a former Khmer Rouge soldier herself, says her husband died in 1992 during a battle between Khmer Rouge fighters and government troops. “During the war, I carried my baby to escape from the fighting,” Ms Ran says. She says life was difficult for her during the war. She says she was not in Mr Muth’s circle during the time the Khmer Rouge was in power, but noted that she has been living in the district for about 30 years and that Mr Muth is a good person. When the reporter asks about the Khmer Rouge Tribunal, she declines to comment, saying that it was a government decision. Mr Muth and former Khmer Rouge air force commander Sou Met were named suspects in Case 003 regarding crimes against humanity committed by the regime. However, a judicial investigation on Mr Met in Case 003/02 was terminated in 2015 following his death. On November 28, judges at the Extraordinary Chambers in the Courts of Cambodia issued a split decision on whether or not to prosecute Mr Muth. The National Co-Investigating Judge ruled that Mr Muth was not a senior Khmer Rouge leader nor was he one of the persons most responsible for crimes committed by the regime. However, the International Co-Investigating Judge ruled that Mr Muth was in fact subject to the ECCC’s jurisdiction because he was a senior Khmer Rouge leader, adding that there is enough evidence for Mr Muth to stand trial. “[We have] sufficient evidence to indict him for the genocide of the Vietnamese, crimes against humanity, war crimes as well as premeditated homicide under Cambodian law,” the ECCC International Judge said. Meas Muth doesn’t think much of case 003. The former Khmer Rouge navy commander is instead here at Ta Sanh Chas pagoda near his home in Battambang province’s Samlot district. Donning a white shirt, gray trousers and a scarf over his shoulder, Mr Muth sits with the pagoda’s chief monk. He often comes here alone or congregates with others who share his belief in Buddhism. Lighting up his rolled up tobacco, the 81-year-old says he has been helping construct additional buildings in Ta Sanh Chas pagoda. He says Khmer Rouge Tribunal officials are prolonging the process for his trial because they have been financially benefiting from the funding the special court has been receiving. When asked about his days before the regime, Mr Muth says he used to be a part of the monkhood. He treads carefully when around reporters due to a bad experience he had with an English newspaper; the experience left a bad taste in his mouth. Any question regarding the case is referred to his lawyer. However, reached by phone on November 29, Mr Muth sided with the ruling from the National Co-Investigating Judge when asked if he should not be held accountable for crimes committed by the Khmer Rouge because he was just a low-level officer. He says it was impossible for him to have committed crimes against humanity between 1975 and 1979 due to his rank at the time. Venerable Serey Prey Tann, chief of Ta Sanh Chas pagoda first joined the monkhood in 1992. In 2000, he met Mr Muth. 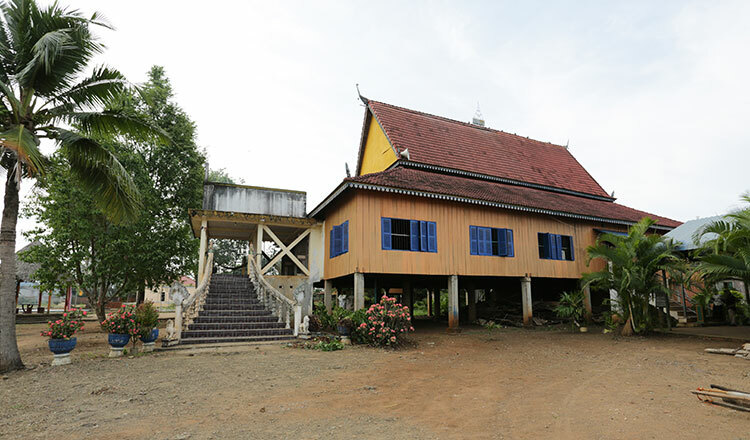 The people living around the area had wanted to develop an empty plot of land to build a pagoda. Since then, Mr Muth has helped to construct several other buildings within the pagoda’s premises. Now at 86, Ven Prey Tann says he could not have been able to accomplish the building of the pagoda without Mr Muth’s help. When asked about Mr Muth’s past and the Khmer Rouge Tribunal, Ven Prey Tann says he doesn’t know much about politics. Hay Borng, an 86-year-old clergyman, says other monks and nuns in the pagoda also say that Mr Muth is a good man. When asked about Mr Muth’s case, Mr Borng also declined to comment. An elderly nun at the pagoda says Mr Muth became sick last year and was sent to hospital in Thailand for medical treatment. His health has since recovered. Mok Phal, 75, says he was an aviation official in the Khmer Rouge regime. Mr Phal says Mr Muth was a navy commander of division 164 in Preah Sihanouk province and that Mr Muth should not be tried and sentenced. Mr Phal says, however, that the court picks and chooses who to charge and sentence. 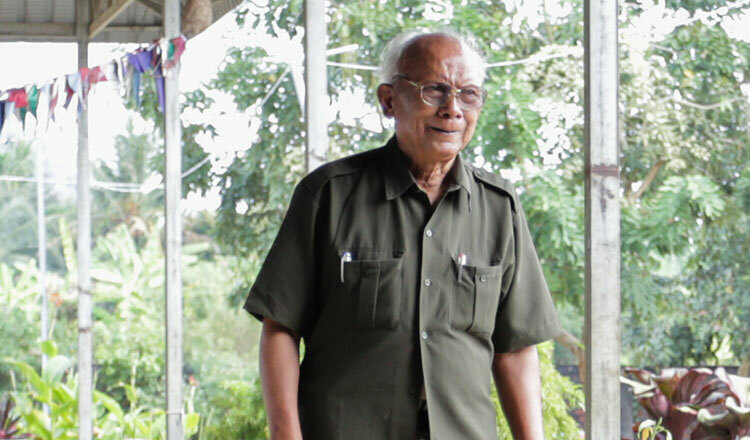 He suspects that some former Khmer Rouge officials negotiated with the government to be recruited within government ranks. “If the court sentences him, it seems like revenge,” he says. As for Mr Muth’s case currently being handled by the Khmer Rouge Tribunal, Ang Udom, Mr Muth’s lawyer, says he will appeal against the split decision. “We are now preparing documents in order to appeal to the Pre-Trial Chamber,” Mr Udom says. Hong Kimsuon, a lawyer representing victims at the court, says judges had different interpretations of the case. “I think it is important, based on the decisions of the Co-National and International prosecutors, whether they will appeal or not,” Mr Kimsuon says. ECCC spokesman Neth Pheaktra could not be reached for comment, but earlier said that the Pre-Trial Chamber consists of three national and two international judges. “A majority decision by the judges in the Pre-Trial Chamber is needed to decide Meas Muth’s case,” Mr Pheaktra added.